I rarely vary my pizza dough recipe. I make a whole wheat crust, in the bread machine, and it takes 1 hour 40 minutes- completely unattended. After reading the information about making homemade dough in this Brooklyn pizzeria cookbook, I felt like I was shortchanging myself and I had to try a new dough recipe. This dough was more labor intensive and had to be planned in advance as the crust is made at least 24 hours in advance, but it was very tender and tasty! This recipe was adapted from Roberta’s Cookbook by Carlo Mirarchi, Brandon Hoy, Chris Parachini, and Katherine Wheelock, of Roberta’s in Brooklyn, NY. In a bowl, thoroughly combine the flours and salt; make a well in the center. In a separate bowl, thoroughly combine the yeast, olive oil, and lukewarm water. Pour the wet mixture into the well in the dry mixture and begin mixing the two together with your hands, gradually incorporating the dry into the wet. This process will be more like mixing than kneading. After about 3 minutes, when the wet and dry are well combined, set the mixture aside and let it rest, uncovered, for 15 minutes. This allows time for the flour to absorb the moisture. Flour your hands and the work surface. Gently but firmly knead the mixture on the work surface for about 3 minutes. Reflour your hands and the surface as necessary. The dough will be nice and sticky, but after a few minutes of kneading it should come together into a smooth mass. Divide the dough into 2 pieces, shape them gently into balls, and wrap them tightly in plastic wrap. Refrigerate the dough for at least 24 and up to 48 hours before using. This process, called proofing, allows for the fermentation that gives the dough structure- which results in a chewy, pliable crust with great flavor. Preheat the oven to the highest temperature, ideally at least 500 degrees F. (My oven has a “Stone” setting as well.) Place a pizza stone on the lowest rack of the oven, if set to “Stone”, otherwise place a pizza stone on the center rack of the oven. Let the oven heat for 1 hour. 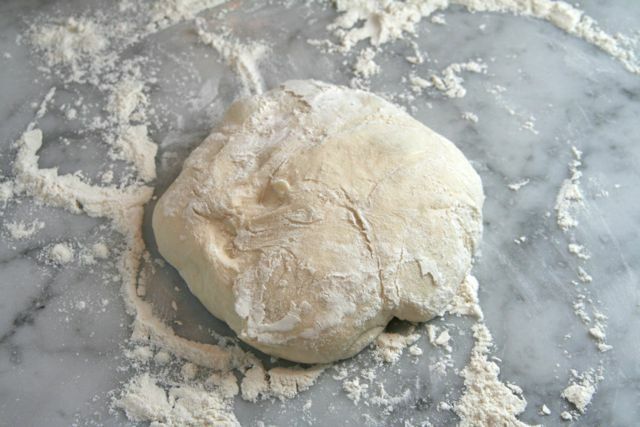 Remove the dough from the refrigerator and let it come to room temperature. Lightly flour your hands and the work surface. Now the dough is ready to be “Slapped Out” (another term for letting the crust form itself). It lets gravity do the stretching and shaping of the dough. Pick up your disc of dough and hold your hands parallel to the floor. Then squeeze your fingers together and curve them so that your hands are like paddles. Drape the dough over one hand and flip it over to the other hand in a smooth motion. Continue moving the dough slowly back and forth, rotating it 90 degrees every few seconds so that you end up with a circle. It will start to stretch. 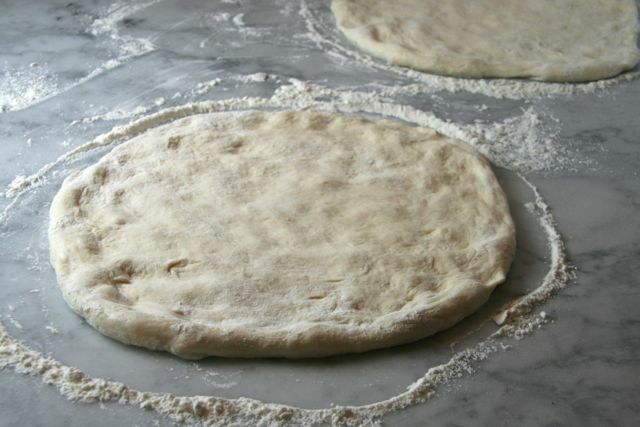 After 1 to 2 minutes, you should have a round of dough that’s about 12 inches in diameter. Transfer it to a floured (I use cornmeal) pizza peel- preferably a metal one- and gently push out any edges that need pushing to make a better looking circle. Top the dough immediately after transferring it to the peel so that it doesn’t start to stick, and pop it in the oven the moment it’s topped; it will get soggy otherwise. Carefully slide the topped pizza onto the stone and bake it for 5 to 7 minutes (watch closely! ), until the crust is bubbling up and beginning to turn golden. Turn on the broiler and broil the pizza for 1 to 2 minutes, checking to make sure the cheese doesn’t get too brown, until the crust is golden and starts to char in a few places. This recipe was adapted from Scientifically Sweet, via Foodgawker. I modified the recipe to make it more garlicky and less spicy. I also adapted it to bake in a bread machine, used a combination of whole wheat and bread flours, and added olive-oil to the dough. Easy & tasty! 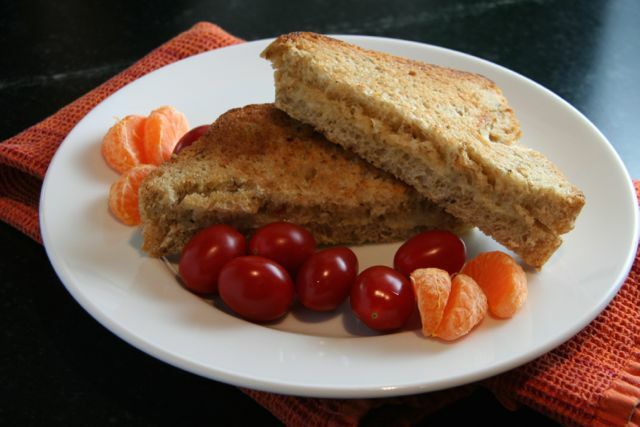 Process on whole wheat bread cycle; use medium/normal crust color setting. 30 minutes before the end of baking, brush the top of the loaf with remaining 1 teaspoon olive oil and sprinkle with coarse salt. 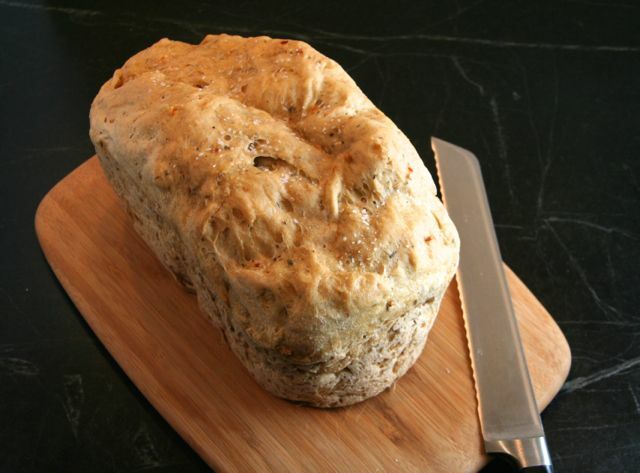 Remove bread from pan; cool on wire rack.